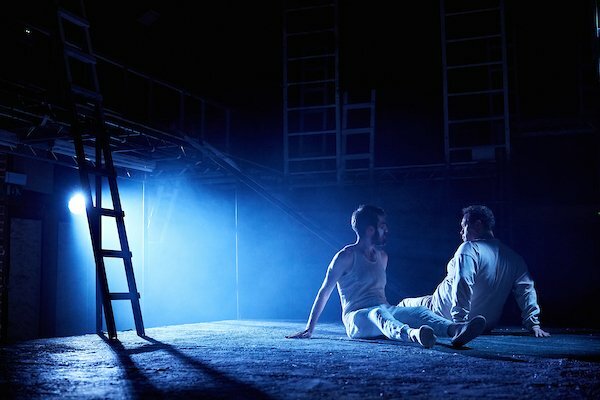 A striking new opera and a vibrantly modern revival of an old one in this imaginative double bill. Bury Court Opera is 10 years old this year, Since 2007 the company has been presenting an annual opera season in Bury Court Barn, a spectacular barn which is a wedding venue for the rest of the year. To celebrate its 10th anniversary, Bury Court Opera presented three operas this year, Mozart's Cosi fan tutte and a double bill which combined a specially commissioned new opera, Noah Mosley's Mad King Suibhne, and Solomon's Knot in L'Ospedale, the anonymous 17th opera which has recently been re-discovered. Noah Mosley's Mad King Suibhne was directed by Ella Marchment and conducted by Noah Mosley, designs were by Holly Piggott, lighting by Ben Pickersgill, movement by Simeon John-Wake, with Dominic Bowe, Edward Hughes, Henry Grant Kerswell, Laura Woods, Isolde Roxby and Raphaela Papadakis. L'Ospedale was directed by James Hurley and conducted by James Halliday, designs were by Rachel Szmukler, lighting by Ben Pickersgill with Jonathan Sells, Rebecca Moon, Michal Czerniawski, Victor Sicard and Lucy Page. Thomas Herford was ill and so Edward Hughes sang the role from the side of the stage which Herford acted it. Noah Mosley's Mad King Suibhne is based on a 12th century Irish poem, with a libretto by the writer Ivo Mosley (Noah's father). It tells the story of King Suibhne (pronounced roughly, Sweeney) who kills his childhood friend Ailill at the Battle of Mag Rath and goes mad. Plagued by demons he flees and is given the power to fly by a witch. The opera interleaves scenes of Suibhne hidden in the forest, encountering natural things, another mad-man and re-encountering the witch, with the problems at court. Suibhne's foster brother Lynschechan tricks him into returning to court but Suibhne cannot cope and flees, Suibhne's wife Eorann is pressured by marry another man, Gauire. But in the final scene Suibhne learns to cope with his demons and is reconciled with his wife, whilst the witch turns Gauire and a lady who loves him both into toads. The opera lasted around 90 minutes and is written for six soloists (playing nine roles), and a chorus of six women who represent the voices in Suibhne's head, accompanied by an ensemble of string quartet, double bass, flute, clarinet/bass clarinet, bassoon, horn and harp. One notable, and highly effective, feature of the score is that the flute and bass clarinet form characters on stage and frequently accompanied Suibhne (Dominic Bowe) in the moments when he was most tormented by his demons. The stripped down nature of this writing, just voice, flute and bass clarinet, contrasted markedly with the lusher textures of Mosley's orchestral writing. Ivo Mosley's libretto was admirably constructed in seven succinct scenes, telling the story with clarity and presenting Noah Mosley with some fine dramatic moments, but I thought that the text could have been trimmed back somewhat and occasionally it seemed a little too verbose, requiring the music to give us some rather wordy passages of dialogue which would have benefited from tightening. Noah Mosley's style is tonal and highly eclectic so that whilst the scenes for Dominic Bowe's Suibhne were often bare and stripped back, with a highly effective use of the female chorus in both singing, speaking and other non-verbal effects, there were also big tunes and moments which were almost musical theatre in their approach. The music for Suibhne's wife Eorann, (Isolde Roxby) was particularly notable for its lush romanticism. Noah Mosley has the ability to craft 'big tunes' and is obviously fond of the Big Romantic Gesture, but the score sometimes felt as if he was trying too hard and it could have been pared back a little. There were a couple of moments when the lyrical impulse seemed to veer a little to close to Broadway for comfort (given the subject matter), and there was a danger that the lovely final waltz might seem a touch too ironical. Dominic Bowe was superb in the title role, really making us feel an empathy with Suibhne and taking us on his journey as he comes to live with his demons. Ella Marchment's production helped by providing Bowe with a richly imaginative but non-specific setting which allowed us to concentrated on Suibhne. Marchment and her designer Holly Piggott cleverly got over the problems of Suibhne's ability to fly, by making ladders a feature of the multi-level set, cleverly manipulated by the chorus. Isolde Roxby was powerful as Suibhne's wife Eorann, clearly relishing the romantic gestures which Noah Mosley had written for her, but it was in the quieter, more concentrated moments when her love for Suibhne was most moving. Henry Grant Kerswell made bluff Lynschechan, Suibhne's conflicted foster-brother, as well as doubling as a mad man. Edward Hughes was suitably manipulative as the plausible yet evil Gauire, aided by Raphaela Papadakis. Laura Woods made the witch a powerfully grounded and earthy figure. The small instrumental ensemble under Noah Mosley played admirably and brought out the score's nicely detailed orchestration. 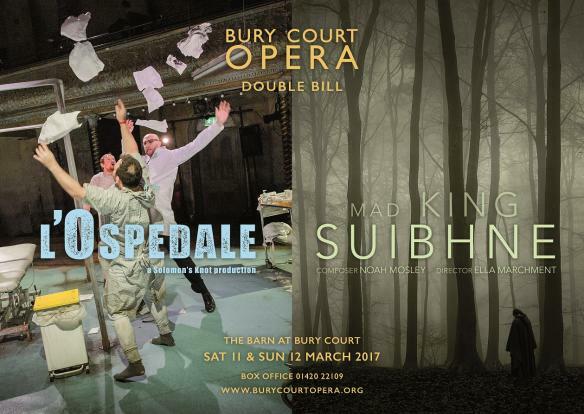 Mad King Suibhne was an impressive and at times powerful piece on a difficult subject, and it is to Noah Mosley and Ella Marchment's credit that the audience was held spellbound for 90 minutes and applauded enthusiastically afterwards. After a dinner interval, we returned to the barn for a very different piece, but one which shared some of the same concerns. Solomon's Knot's production of L'Ospedale premiered in 2015 (see Ruth's review on this blog). The 17th century libretto is by Antonio Abati but the composer is currently unknown though it may be Giovanni Felice Sances (1600-1679). The plot concerns an over-stretched state hospital with four patients awaiting the arrival of the doctor, along with a jaded hospital worker. When the doctor arrives his unorthodox approach leaves the patients in chaos. The piece has a spoken prologue and epilogue, here given in English as a voice over apparently the health minister in parliament. The opera itself was sung in Italian, and the edition of the score used was by Naomi Matsumoto and Solomon's Knot, with two Gesualdo madrigals added. James Hurley's setting was modern day, and provided some highly physical theatre which mirrored the extremes which the libretto depicts. At times it was difficult to believe that the text had not been radically updated (it hadn't). Lucy Page was the jaded and hard working hospital worker, warning the patients not to depend to much on the doctor, who was only out to make money. Each of the four patients had a different yet problematic illness, Rebecca Moon was touching is a woman with a pain in her heart, Thomas Herford was puzzled and desperate to leave as a man with a pain in his chest (ably sung by Edward Hughes), Michal Czerniawski was cruelly treated as the main with a pain in his head and Victor Sicard was moving as the poor man, the main with the pain in his wallet. Jonathan Sells was brilliant as the doctor, who cannot cope and whose treatment verges on madness. And this accumulating madness was reflected in James Hurley's highly physical production which vividly evoked the combination of comedy, cruelty and physical theatre familiar from commedia dell'arte. James Halliday directed the small ensemble from one of the two harpsichords. For all its modern dramatic feel, this performance was a nicely poised piece of 17th century musical theatre, with a nicely close integration between singers and instrumentalists.